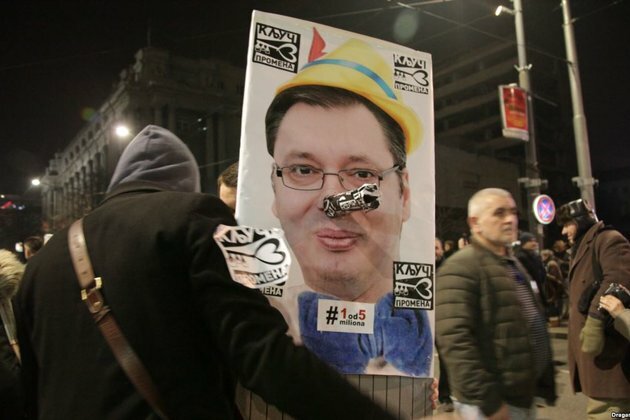 Thousands of people have rallied in Belgrade and other cities across Serbia on February 9 for the 10th week in a row to demand the resignation of President Aleksandar Vucic. The rally in the capital was joined by Belgrade university students who called on their fellow students to join the protest and demand the resignation of Education Minister Mladen Sarcevic. The protesters have been accusing Vucic of stifling democratic liberties, cracking down on political opponents, and controlling the media. He denies the accusation. The demonstrations were triggered when a gang of thugs beat up opposition politician Borko Stefanovic in November.